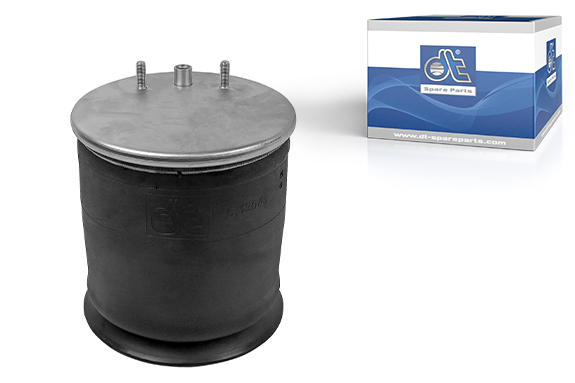 The air spring is an aid to achieving a smooth driving style and is a contributory component in regulating the vehicle height. The air spring 6.13041 is distinguished by its high-quality finish. The individual components are produced according to the latest technology and coordinated. This ensures a perfect fit, optimum vehicle suspension and driving dynamic, as well as the optimal height of the vehicle, which is regulated by the level control regardless of load conditions. The rolling piston of the air spring is made of plastic. Attention must be paid to the specified mounting torque of the screws and the compressed air hose. Otherwise, the resulting vibrations could cause the screw connections to loosen or, in extreme cases, to tear away. Furthermore, the compressed air hose must not be kinked or damaged. Particular care must be taken when laying the cables. In order to avoid damage to the material of the spring, there may not be any foreign objects in the working area of the air spring. After replacement of the air spring, we recommend a calibration to ensure an optimal driving level. The hollow spring serves as a buffer for limitation of spring compression and ensures emergency running properties.